It’s just like any other argument, Erich Lange ’19 reminded himself on the Salter Hall stage for the 25th Wabash College Moot Court competition Wednesday evening. He walked up to the podium. The audience faded. “May it please the court,” he began. It’s just like any other argument. But sitting in front of him was Chief Justice of the Indiana Supreme Court Loretta H. Rush, and the voice in the back of his head changed a bit. Moot Court is a competition where students stand before a panel of judges and argue a legal dispute adapted from an actual case pending before the United States Supreme Court. This year’s case was a variation of Johnson v. United States, a Seventh Circuit case that considers the circumstances in which police can reasonably approach and search a parked car based on a suspected parking violation. The four finalists, Kwaku Sarpong ’22, Nathan Gray ’20, Jake Vermeulen ’21, and Lange, were asked about probable cause, reasonable suspicion, and racial profiling. 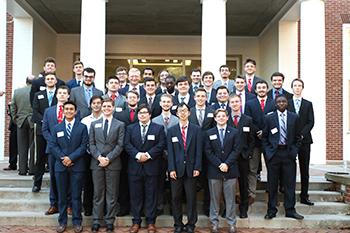 Wabash College is one of the few undergraduate institutions with a Moot Court competition, which gives students thinking about a career in law a sizeable, and early, advantage. 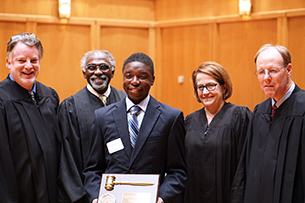 After receiving high praise from all four judges, it was evident that the law really liked the night’s winner – Kwaku Sarpong, who became only the second freshman to win the competition. Though he likes law, Sarpong hopes to attend medical school. He thought about working in criminal law but realized he might have to take on cases he found morally compromising and decided he couldn’t argue something he didn’t believe in. It was that passion that came through in his rebuttal Wednesday night, which solidified his first-place finish. 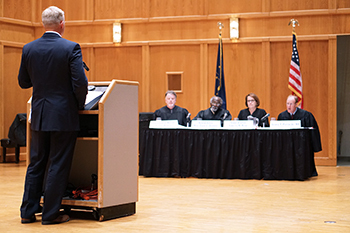 In its 25-year history, the popularity and prestige of Wabash College’s Moot Court has continued to grow. Also on the evening’s panel of judges was George Patton ’84, an attorney and partner with Bose, McKinney & Evans, who played an important role in establishing the competition. “This started out as a v ery small program,” he said. “There were more judges than students the first year, and now to see almost 40 students doing this and the quality of judges we have…I’m very proud. The annual Moot Court competition is sponsored by the Indiana Association of Wabash Men and the Rhetoric Department.